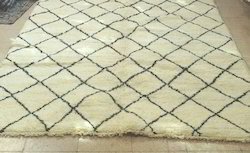 We also offer an extensive range of Moroccan Rugs in industry. The range offered by us is acclaimed for their designs, elegant patterns, vibrant colors, perfect finishing and durability. We have designed our range in accordance with the clients’ diverse requirements and specific needs. We do not compromise with the quality of the products, therefore we make of quality tested fabrics in fabrication of these carpets. We are among the eminent names in industry, we are engaged in manufacturing and exporting a vast variety of high quality Floral Design Beni Qurain Carpets. The range offered by our company is fabricated by using premium quality fabrics and latest machinery tools, which ensure their reliability and increase their strength. In order to meet the diverse requirements of our clients, we have designed and developed our range in various colors, sizes and designs. 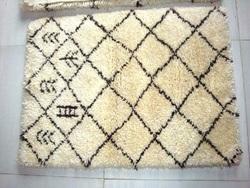 Clients can avail an exclusive range of Beni Rugs from us. These carpets are designed keeping in mind clients’ varying demands and specific requirements. Our range is extensively demanded and appreciated all over the world for their smooth finishing, elegant designs unique patterns. We have made use of best grade fabrics and advanced technologies in fabrication of these carpets. Apart from this, we offer timely delivery of these carpets. We also offer an extensive range of Hand knotted Beni Qurain in industry. The range offered by us is acclaimed for their designs, elegant patterns, vibrant colors, perfect finishing and durability. We have designed our range in accordance with the clients’ diverse requirements and specific needs. We do not compromise with the quality of the products, therefore we make of quality tested fabrics in fabrication of these carpets. Packaging Details: 3 layers . As a leading manufacturer and exporter, we are involved in providing a wide Handmade Beni Qurain Rugs that are fabricated under the supervision of our highly skilled and dexterous professionals, who keep an eye on all the ongoing processes. The hardworking weavers of our firm have designed these carpets in the accordance with the latest market trends. Our range is accredited for their flexibility, weather resistance and optimum strength. range of Multicolor Hand Tufted Carpets. 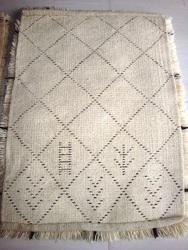 Looking for Handmade Moroccan Carpets ?